For those of you who have been following my boot quest on this blog, you will be pleased to know that I have finally come to the end of my journey. 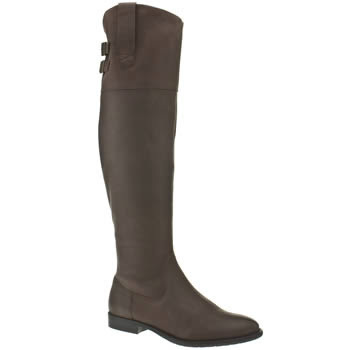 At the weekend, I found the Kourtney Riding Boot £110 from Schuh. I know, I was looking for tan, and these are brown, but these are just so perfect in every other way. Here's a pic, but you should know that they look ten times nicer in the flesh. The leather is very soft and looks expensive, and they are a very comfy fit. Even better, they are super long, and come up to just below my knee. Love them. And my mum has bought me them for Christmas, so the only drawback is that I have to wait until Christmas Day to wear them. Worth the wait I'd say. Also, whilst I was in there, I tried on the Porto Riding Boot which I'd mentioned previously on this blog - not good. They look very wellie-ish on the ankle.